Good morning All! 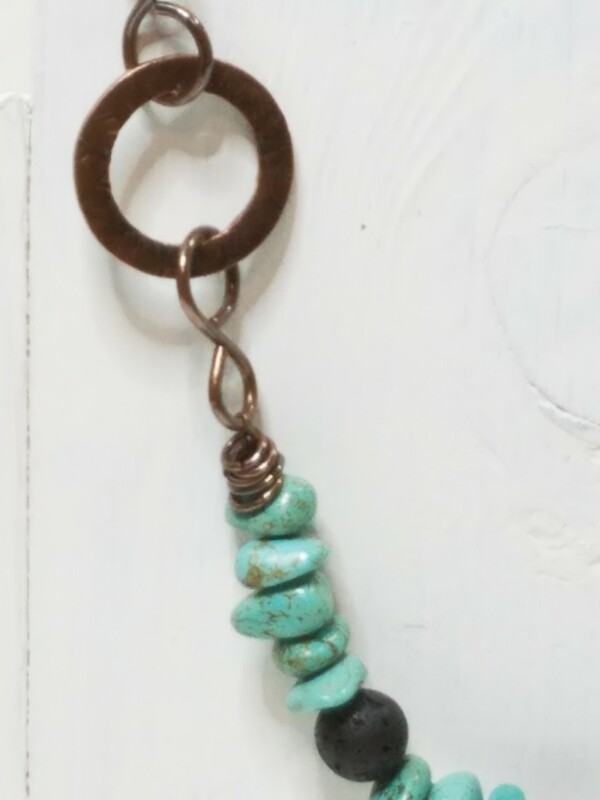 I am happy to say that I have finally gotten back to making some jewelry. This essential oil infused necklace is the first piece of jewelry that I’ve made in quit a long time. It all came about in a strange way. Starting off by buying some eBooks on selling on Ebay. One of the things Ann Eckhart recommended was to start off by buying some inexpensive items off Ebay to get rated before I start trying to sell on there. While looking at jewelry supplies when ordering more liver of sulfur, I ran across some lava beads. 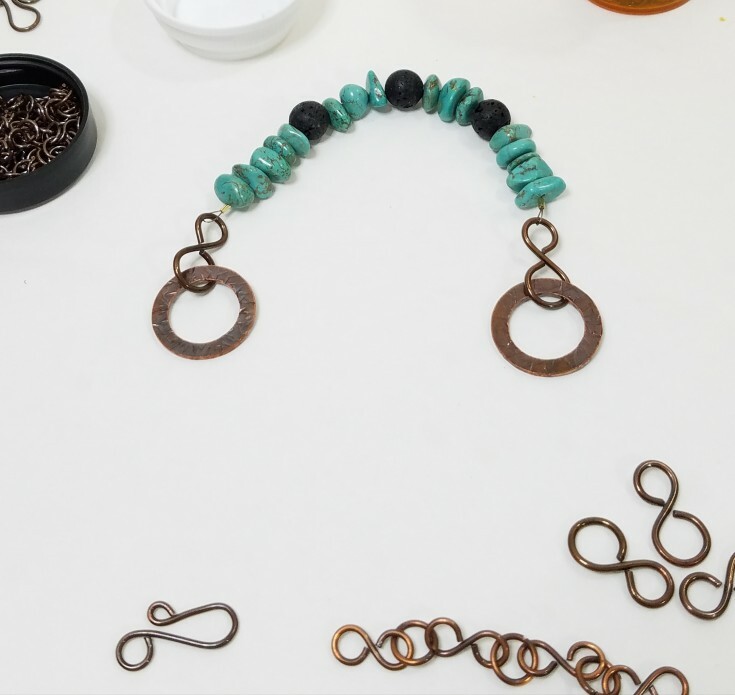 Which is what is used for essential oil infused jewelry. 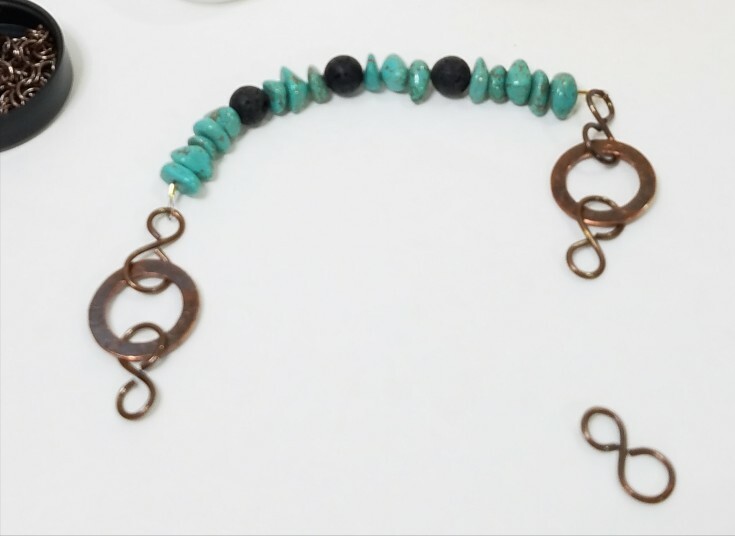 So, while working on one of my Christmas gifts I got to thinking of these lava beads and before you know it I whipped up a necklace for myself remembering how much I enjoyed making jewelry, and wondering why I ever stopped. Well that’s not true, I do know why. It’s because I got discouraged because I wasn’t making very many sales. I do believe that was due to not only promoting like I should. But also, bad photos, not making my titles more search engine friendly, and not knowing how to charge for shipping without running to the post office for every item. Even than if I don’t have the zip code I can’t get a true amount for shipping. The eBooks that I purchased has helped me to understand the shipping part a little bit better, plus Ebay has a shipping calculator that calculates the shipping when some one commits to purchasing an item. Even for other countries outside of the U.S. as well. Recently a blogging friend of mine wrote a post on shipping that gives a lot of great tips “14 Easy Tips to Help You Conquer Shipping Fears”. So, it the shipping part scares you don’t forget to hop over and check it out. I will be giving Ebay a try now that I have an idea on how to calculate shipping, and have a digital shipping scale now. I’m hoping that it will also help me in my Zibbet shop as well. Another thing that I have learned that I hope will help is for my titles to use keywords, as many as I can use in the title that tell what the piece is. You want the search engines to land on your page for keywords that are relevant to what you are selling. Wish me luck, and I will get on with how to make an essential oil infused necklace. 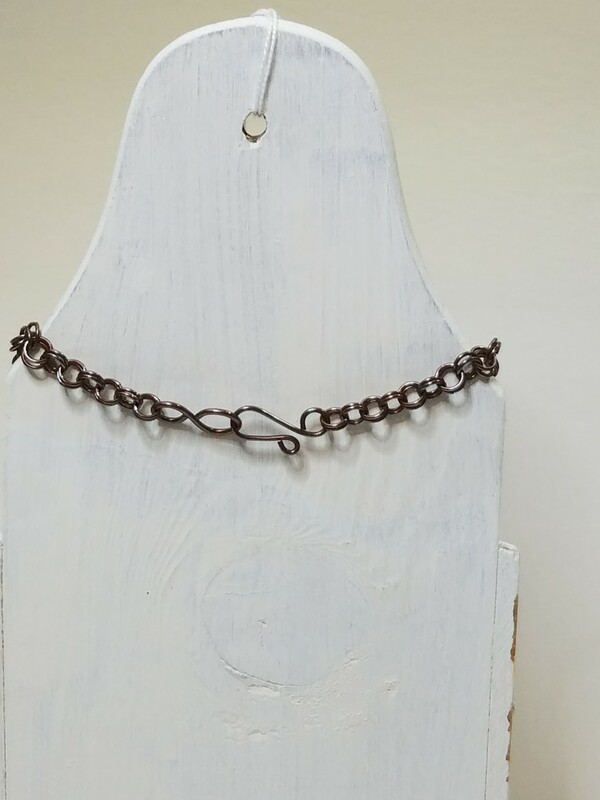 For this necklace I decided to make my own chain out of copper. I already had jump rings cut so all I had to do was to put the chain together. 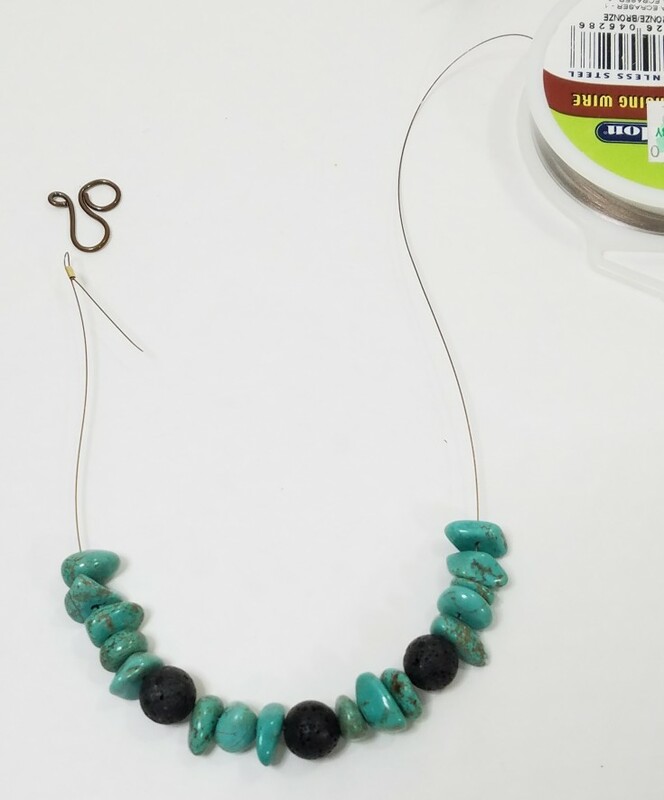 But first I made the front part of the necklace using bead wire I added five turquoise nuggets, then a lava bead, then three more turquoise nuggets, a lava bead, three more turquoise nuggets, another lava bead, and five more turquoise nuggets. I then added the crimp beads forming a loop on each end using the crimping tool. 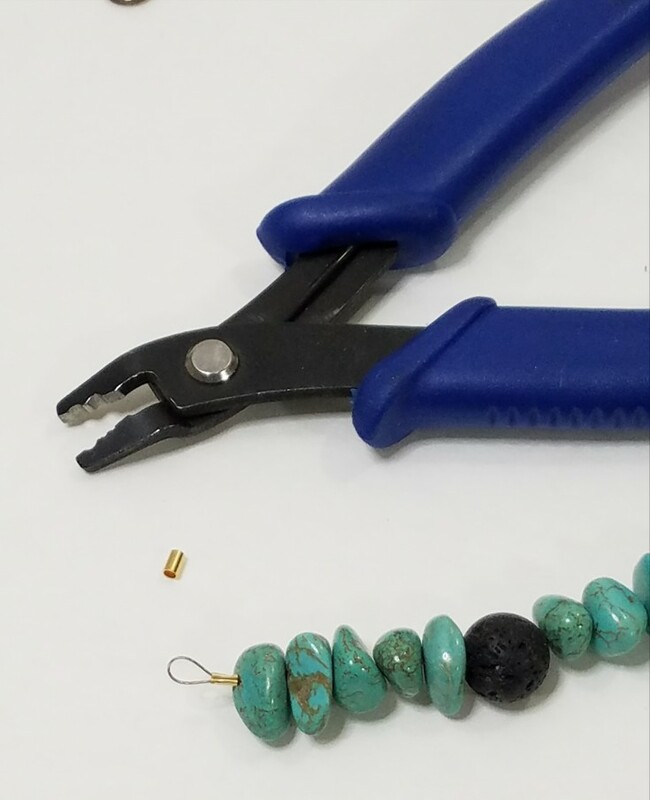 Here’s a tutorial on how to add the crimp beads. Next, I added some figure eight links that I had on hand. 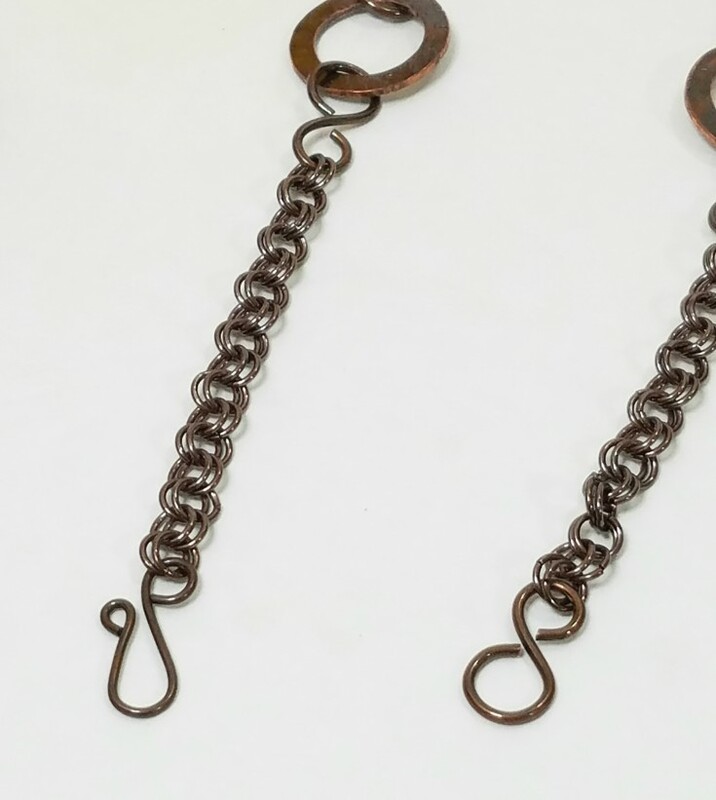 Then some textured copper tube links, and another figure eight link. 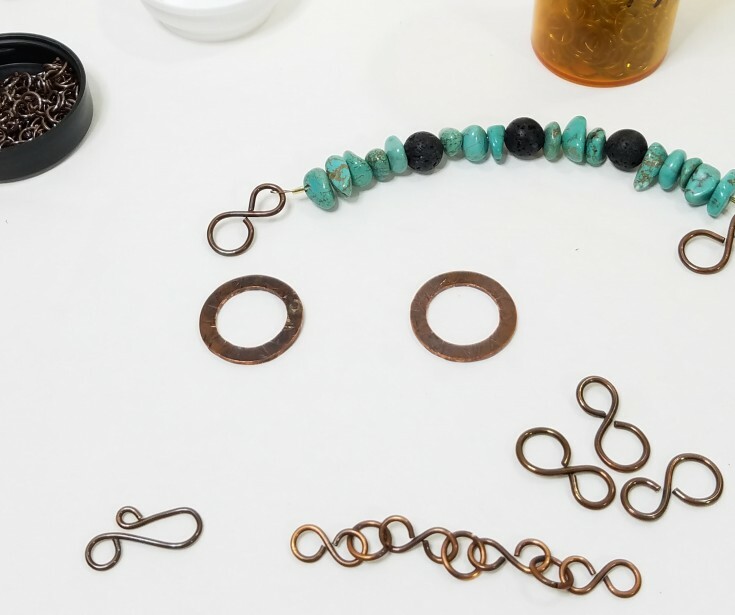 The copper chain was put together one jump ring at a time. Doubling each link making a sturdy double chain. Each side was made the same link. 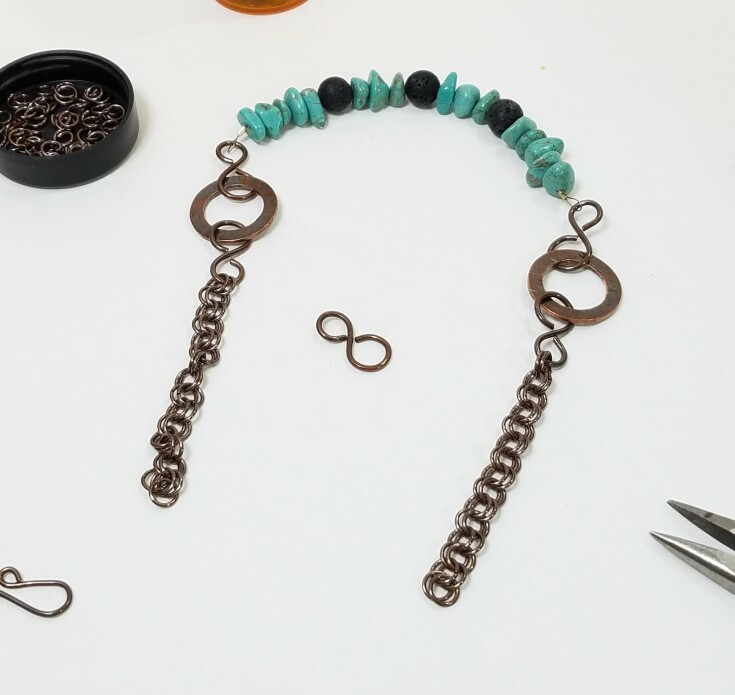 Then I added my handmade clasp on one end, and a figure eight link to the other for the closure. I didn’t care for the crimp bead and the bead wire showing. So, to hide it somewhat I added more jump rings around the bead, and wire forming a stacked ring look. That’s it! It took me about an hour to make. But if you had a chain already together it would of took a lot less time. I’ve always loved to make my own jewelry components whenever possible, and I still have quite a few made up, and ready to use when needed. 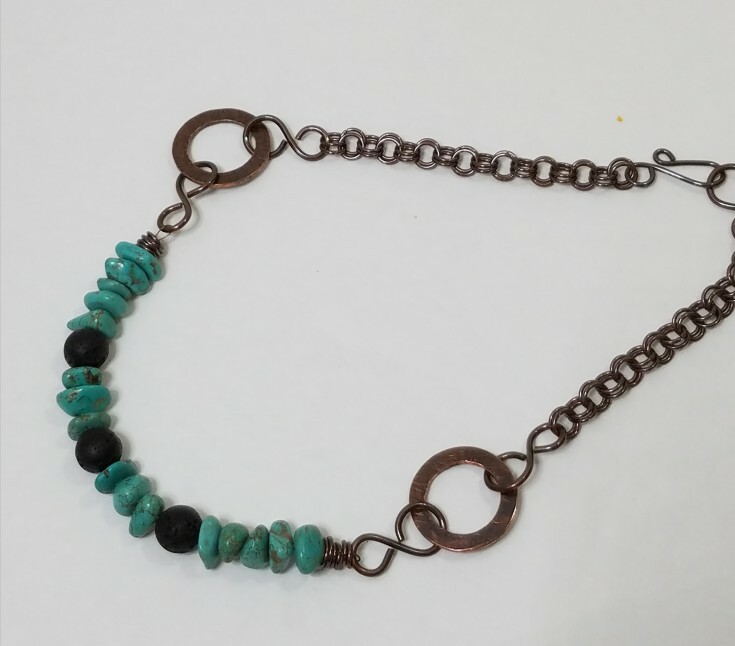 I love making my jewelry and it was a lot of fun when I worked…now I have this stuff I never wear! I recently just purchased a wire jig for doing wire stuff….and as of yet, not used it. Love this…awesome job. Sounds like me. 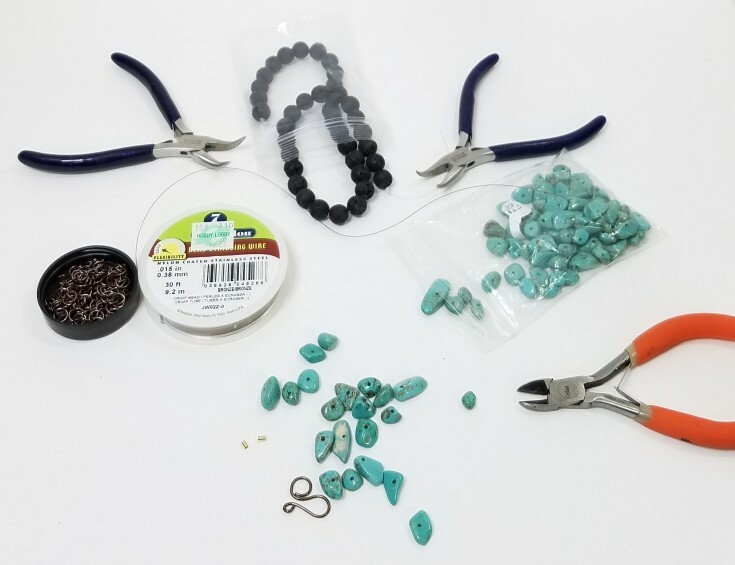 I love making jewelry, and have lots of supplies. Some I have barely even used. 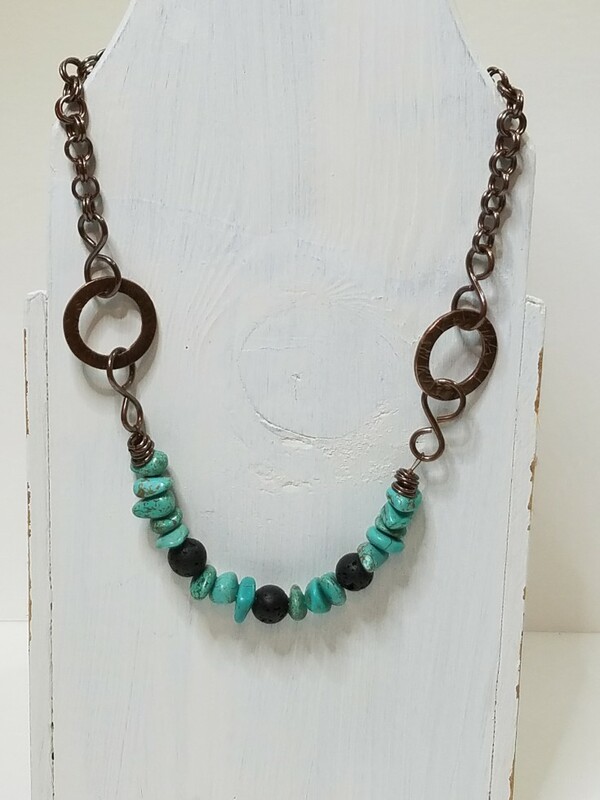 I have never really worn much jewelry to begin with, just loved making it. Was hoping to sell more of it without much luck I don’t make much anymore.